Meet Mike Birbiglia. He claims he jumped out of a second-story hotel window to avoid a missile attack. Witnesses say a madman crashed through a window in the middle of the night and then stumbled badly injured into the hotel lobby. Birbiglia was as surpised as the hotel guests when he woke up covered in gashes. The guided missile attack was a nightmare but his actions were anything but a dream. 33 stitches and an overnight sleep study later Birbiglia was diagnosed with REM sleep behavior disorder, a parasomnia that causes the body to physically act out dreams. The series of encounters leading up to his diagnosis are the subject of a series of memoirs titled Sleepwalk with Me. Birbiglia makes his living by standing in front of an audience recounting long, embarrassing stories about his life. His darkly humorous accounts of REM sleep behavior disorder have earned him a Nathan Lane produced one man show, several Comedy Central specials and a spot as a semi-regular contributor to NPR’s This American Life. Along the way he’s become the unofficial face of REM behavior disorder. Fans have approached Birbiglia to tell him they’ve had similar sleepwalking experiences and won’t repeat his mistakes. 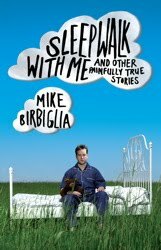 In an interview with Time Magazine, Birbiglia admitted he sleepwalked for years before he was diagnosed. Birbiglia limits the frequency of these episodes by taking clonazepam, a drug used to treat seizures by activating parts of the brain to produce a calming effect. Because there is no cure, he sleeps in a makeshift cocoon. He wears a sleeping bag up to his neck with mittens so he can’t open it and get up. Sleepwalk with Me is on bookshelves now. Look for the film version written and acted by Birbiglia coming soon. Hear Mike Birbiglia's live full-length performance of how he leaped through a hotel window on This American Life or listen to a in-depth interview on NPR's Fresh Air.